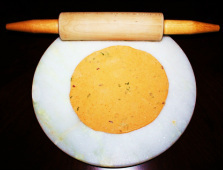 Besan ki roti (gram flour) is a classic North Indian flavorful roti. 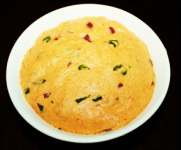 Besan is also known as gram flour which is made from ground dried chickpeas and yellow in color. 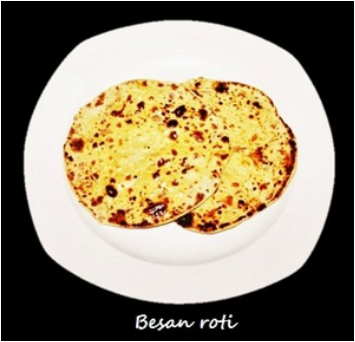 Besan roti is made with the dough of besan and wheat flour and seasoned with spices. 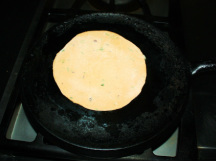 To enhance the flavor onion and Methi (fenugreek leaves) is also added to it. All the spices and ingredients are kneaded into the dough. Besan ki roties are nutritious because of the protein content of chick peas. 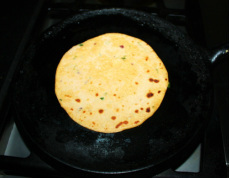 Gram flour is gluten free that is the reason whole wheat flour is added to make the dough and roti. If you have gluten allergy then instead of wheat flour you can add mashed boiled potato to make the dough. 1. 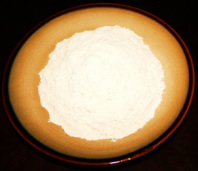 Place besan flour (gram flour) and whole wheat flour in a bowl and mix. 2. Add chopped onions, chopped coriander leaves, chopped green chilies, salt, red chili powder, and asafetida, in the flour and mix everything together. 3. Add a little water at a time and mix it in a rotating motion from the center of the bowl to outward until it form dough and it cleans the sides of the bowl. 4. Dough may seems to be sticky, knead it with some oil in the hands, make a ball and put it back into the bowl, then cover it and keep it aside for at least half hour. and roll it in between your palms in to a ball. 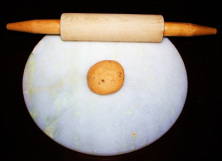 and with the help of a rolling pin roll into a 6” circle or as you prefer. is too dark or burn, it is too hot, adjust the heat accordingly. 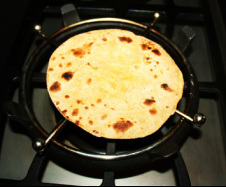 gas stove, keep moving the roti in a circular motion about all the time. apply some butter or ghee. 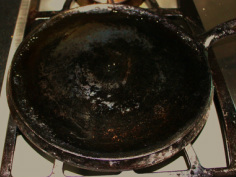 Serve the roti hot. 1. 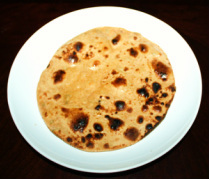 Fresh chopped ½ cup of methi or ¼ cup of dried methi could be added to the flour. 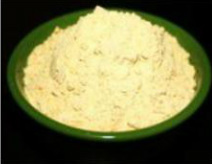 2.Grated muli (white horse radish) could be added to the roti. 3. Any spice or ingredient could be added or taken off according to taste. 4. 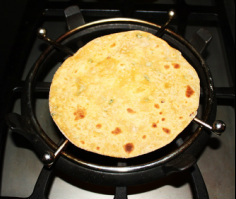 If you have electric stove then take a rack and place it over the burner, and then cook roti over the rack. 5. Make extra roties and store them.